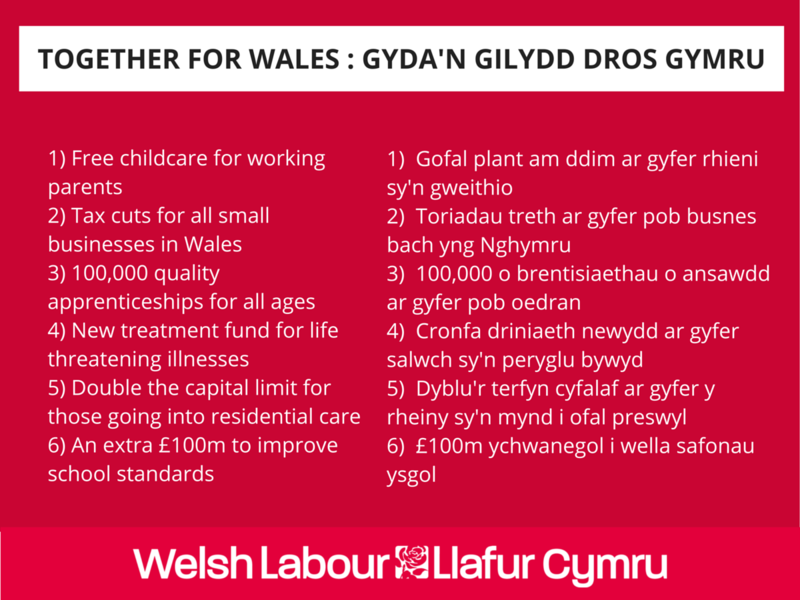 Welsh Labour have launched an ambitious policy offer ahead of May’s Assembly election that will boost prosperity and opportunity in the Vale of Glamorgan. The package will reward responsibility and extend Welsh Labour’s support for families, businesses and older people and build on the continuing improvements in Welsh schools. “Welsh Labour have a record of delivery in Government despite huge cuts to the Wales’ budget by the Tories. These pledges build on Welsh Labour’s successes over the past five years and will have a positive impact across communities in the Vale. “Tax cuts for small business, free childcare for parents, 100,000 new apprenticeships for all ages and building on our best ever GCSE results with a school improvement fund will all support growth in our local economy and give people the opportunity to succeed. We believe that when you are sick you deserve the best care and if, as an older person, you need residential care then you should be able to keep more of the money you’ve worked hard for. “In 2011 I promised the people of Wales a decade of delivery. I said that despite the record cuts to our budget, we would fulfil the promises we made to steer the country through tough times. We are half way through that journey and on the promises we made in the last election, we did deliver. Today I set out six new promises. Welsh Labour’s pledges to the people of Wales. “Building on our successful apprenticeship scheme we will fund 100,000 new apprentices of all ages. Recognising that small businesses are the lifeblood of our economy and local communities, we will use our new powers on business rates to give effective tax-breaks for all small businesses in the country. “Following on from the record GCSE results achieved last year, we want to go further and do better still, so we will create a £100m fund to improve school standards further, giving teachers and education professionals the resources they need to realise our children’s’ ambitions. “The NHS is our proudest achievement in Wales and in recognition of the continuing advances in technology and medicine we will create a New Treatment Fund to support people with life-threatening conditions. “A future Welsh Labour Government will also provide 30 free hours of childcare for working parents. Our offer – covering not just 38 weeks, but 48 weeks’ worth of care for 3 and 4 year olds – will be the most generous in the UK and provide an important helping hand for families right across Wales. “We believe that people in old age who need extra help – those who have played fair and paid in – deserve a fairer deal. So we will double the capital limit they will be allowed to keep on the sale of their home should they need to go into care – an effective £26,000 tax-break for thousands of older people in Wales. Responsibility rewarded. That is the kind of Wales I believe in. “A helping hand for parents, breathing space for small business, continuing improvement in schools, the latest treatments for the sick and fairness for the older generation.